Obesity levels in South Africa are the same as in the United States, say doctors at the first international meeting on obesity in Africa. 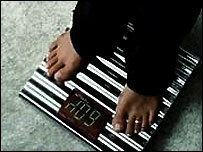 In South Africa, one in three men are overweight or obese, while for women, it is more than one in two. But as many people die of malnutrition in South Africa as of diseases associated with obesity. Some 200 delegates in South Africa are discussing how the obesity is becoming a global epidemic. Because as many South Africans die of malnutrition as they do of diabetes, heart attacks and cancer, the first obesity meeting in Africa is being held in South Africa's Sun City. Obesity levels are rising elsewhere too. Doctors at the conference will argue that obesity has created a double burden of disease across Africa. Developing countries that still have not overcome malnutrition now have to treat people for illnesses caused by them being overweight. The conference is the first of a series of regional meetings preparing for a World Obesity Conference in three years' time. Subjects under discussion include nutrition and diet, the effects of lifestyle, and the kinds of health problems that can develop. Most men stroke their fat bellies as a sign that they have money, especially when in public. The bigger the belly , the better. This is the philosophy in my country. Having a fat tummy also commands respect. People associate that with power since 99% of our politicians are fat. I only recently learnt that obesity is a disorder with lethal results. In my country it appears all those in salaried employment are overweight. Thin people are considered mean and probably sickly. In my country, thousands of people go to bed and wake up hungry. How we wish we had problems with obesity. Lack of education, good roads, good government, and jobs will always be our main discussion, NOT OBESITY!!! It is no surprise that there are obesity problems in South Africa. In many of the cultures, plenty of food on the table is proof of wealth and success. In the Afrikaans (dutch) community, the cuisine is a 'cholesterol-festival'. After dating an Afrikaans girl for some time, I discovered this. Even with a BIG appetite, I was dreading the next meal where it was considered an insult not to have a large second helping of steak, potatoes and all the trimmings. There was no end to the stream of cookies, cakes and desserts that were for in-between meals. They were always just EATING, EATING, EATING. Growing up in Kwa-Zulu Natal, which is predominantly populated by the Zulu people, I believe that it is indeed a sign of wealth. This is a very male orientated idea as the more "fuller" your wife and children appear, the wealthier the man of the house will appear to others. I think that obesity is the least of the problems in Africa when you take into account the continuing spread of Aids, the poverty and the lack of education for children. Being fat in Africa is a sign of health and wealth. Our mothers-in-law demand to see daughters-in-law who make the earth tremble when they walk (umfazi ohamba kunyakazele umhlaba). This is the sign of a true African woman. In a country like Zimbabwe where an estimated 1.4 people are suspected to be living with HIV/Aids, you just cannot contemplate loosing weight without fearing that your neighbours will start whispering that you have Aids. Man and women alike feel comfortable dating a fat/big person because they are considered "clean". Hence the colloquial name for AIDS in west Africa is "slim"
Obesity is not a problem in my country. Because not everyone can afford to buy food, so when a person is "thick, healthy, solid and fat" it is considered a great sight. Men love, I mean love fat women. Whenever a man tells a woman you are fat, it is consider a compliment and ladies love to hear that. The rapid spread of AIDS is our major problem in Nigeria. Not Obesity. I think it's generally believed and agreed especially in Africa that being fat is a sign of good living, wealth and respect. In some parts of Nigeria, the middle belt to be specific, you will not be given a wife if you can't eat very much hence you'll be tested with food before their daughter can be released to you for marriage. It is believed that if you can't eat much then you are a stingy man and you will not be able to feed your wife hence they don't want their daughter to suffer when she eventually gets married to you. Well...I'm not surprised obesity is a problem in South Africa. I grew up in Botswana and thus made frequent visits to South Africa. There was too much junk food everywhere. In Ghana, junk food seems to be more expensive than nutritious food. Thus we eat what we can afford. That means we have less people suffering from obesity. Junk food must be made more expensive! Yes it is true that in Zimbabwean African culture, for a man to be obese means that they are rich and well off in the contemporary era. Historically, before money came into the equation, one's status was judged by one's livestock. These days, now people dwell in urban areas, being overweight is definitely sending a message to the public that one is well-off. It is also a must in Zimbabwean culture for one's children to be seen obese - as a sign that they are being taken care of. If they are seen being skinny and always eating at the neighbour's household, this is a sign that the children's father is poor as a church mouse. Whose fat is it anyway? Are smaller chocolate bars a good idea?